Working with computers day in and day out can leave me burned out. I’ve tried a variety of ways to deal with this over the years, and about 7 years ago, I keyed in on one of my other passions and leveraged that as a way to “unplug” (so to speak). I am fascinated with the age of sail. To me, tall ships are some of the most majestic things that have ever been built by man. While I am aware of the grim realities of life in that era, it is still possible to romanticize it. However, I digress. I leveraged this passion and began building model ships. I started with plastic models and quickly burned through a variety of models due to the relative simplicity of putting together a plastic model. Then, I few years ago, my father gave me a wooden ship model. I loved it. That is when I truly began to turn to model ship building as a way to turn off my digital life. Since each model takes months and in some cases years to finish, there is always something there waiting for me. I’ve built several more wood models since that first one that my father gave me, and I have been slowly learning tricks and techniques to add more and more detail to each subsequent model. Most recently I have been working on a cross section of the H.M.S. Victory. As I have been tying down the rigging, I started thinking about ways to up the level of detail on this model. One of the ways that I am trying to accomplish this is by adding the rope coils that would exist on the pins and decking of a working ship. At the scale that I am working, this proved to be an interesting exercise. I wanted to make two different types of coils. the first is the type that all of us are familiar with, the type that most of us use to bundle extension cords and lengths of rope that we have laying about the house. The second type are a spiral that would lay flat on the deck and out of the way. The first type of coil is relatively easy. You need scale rope (thread will work), tweezers and some glue. 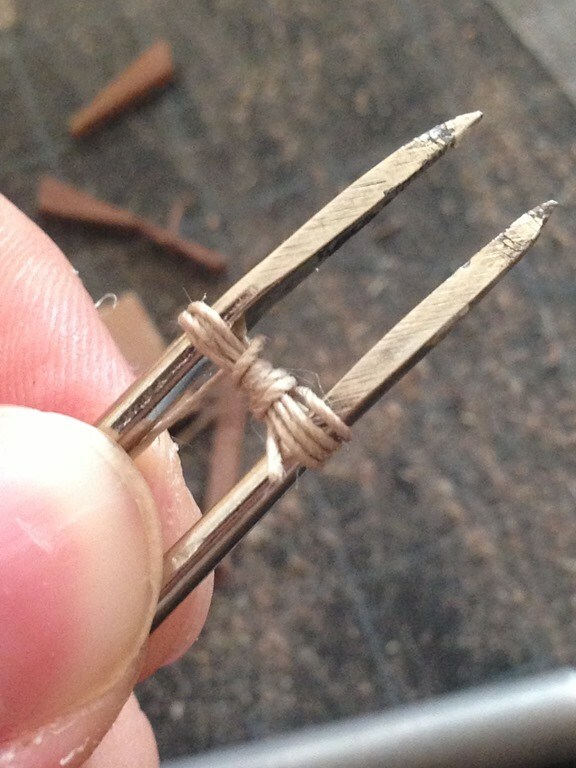 Toward the narrow end of the tweezers, start wrapping the thread around using your thumb to hold the loops in place. 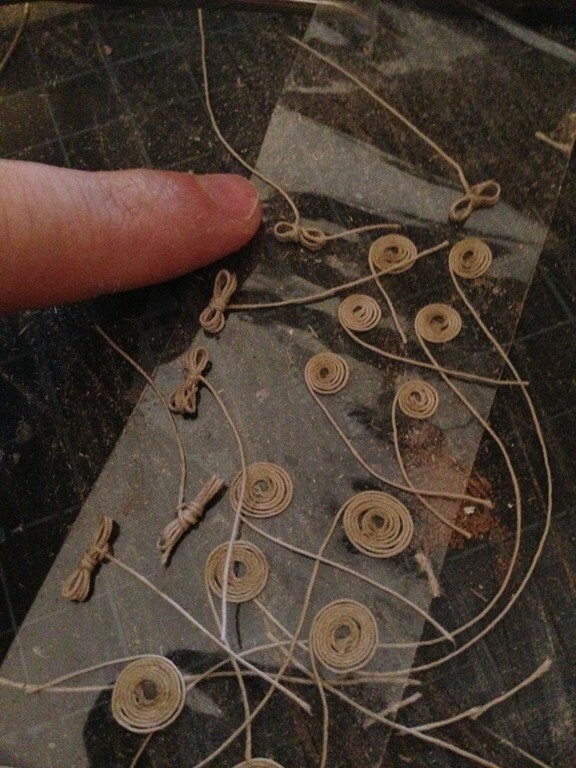 Depending on the size of the coil you want to make, add additional loops. Don’t wrap too tightly so that you don’t start compressing the tweezers. To help with this, depending on how dexterous you are, you can use one of the fingers your are holding the tweezers with to keep them separated. Once you have the correct amount of loops (I recommend 4-6), take the thread and wrap it once lengthwise inside the tweezers around the coil that you just created. Start pulling that single lengthwise loop tight as you slowly move the coil toward the end of the tweezers. DO NOT take the coil off the tweezers yet. By moving the coil toward the end of the tweezers, it should allow you to fully tighten the lengthwise loop around the coil. 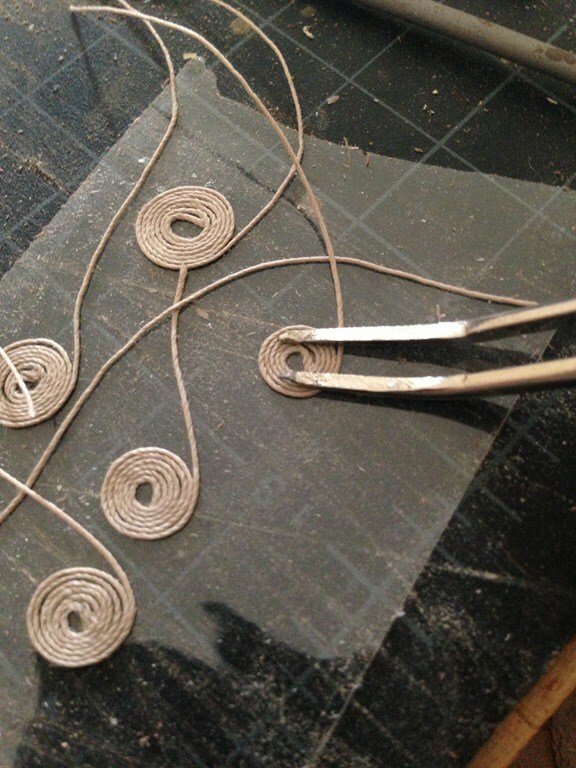 Continue wrapping additional lengthwise loops until you are content with the finished product. At this point, you should have something that resembles the picture. For the final loop, cross the thread back under itself (just like you would on a larger version of the coil). With the coil still on the tweezers, apply some glue to the lengthwise coils and then set it aside to let it dry. The second type of coil is our flat spiral. If you are familiar with sailing lexicon, this is called a Flemish Flake. Normally, these are started from the outside in, but in our case, we are going to start them from the inside out. We are going to need wide packing or masking tape, tweezers, scale rope (thread will work again), and some white glue. Tear off a piece of tape about 2-3 inches long. With a length of rope/thread use the tweezers and press it down onto the tape. Using the tweezers to keep the rope pinned against the tape, start wrapping the rope around the center point. Once you have a full revolution around the center point, pull up the tweezers and press out the circle you have made so that it is flat against the tape. Again, use the tweezers to hold the center and start wrapping the rope around the coil keeping the rope as close to parallel to the tape as possible. What you are trying to do is pull the rope tight against the previous round of the coil using the tweezers to create a barrier between the rope and the table that the tape is laying on without letting the rope to double up on itself. The first few rounds of the coil are the most delicate, the most you have, the easier the going. After you have created a coil / flake of the desired size, take some white glue and sub it across the surface. Once it dries, you will be able to pull the coil off of the tape and it will stay in the desired shape. From here, it is up to your imagination about where to place your new creations. In both of the above, it is advantageous to leave a length of rope/thread off of the end of your coil so that you can use that to blend your coil in with the rigging that you have run on your model.